Monty (with a moustache and sunglasses) is on the right side second row behind the lady with the big white collar. The person who invents a gender neutral third-person singular pronoun will probably win the Nobel Peace Prize. I remember when Equal Rights for Women was a political debate, and I damn sure wanted equal pay for my daughters’ equal work. Which brings me to Betty Ford, a champion of Equal Rights for Women, who recently died at 93. 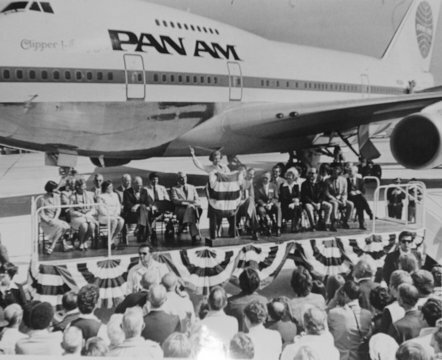 On May 4, 1976, First Lady Betty Ford came to the Weir Cook Municipal Airport (now Indianapolis International) to christen the Boeing 747SP, a shorter version of the Boeing 747 that was to take off that day and set a speed record to the Far East. My boss at Curtis Publishing was a Republican stalwart who had made the China trip with Nixon. He needed a stand-in for the Betty Ford airport event; and since I could be quickly cleared by the Secret Service because of my military service and work with the State Department, he asked me to do it. It gave him great pleasure to send me, the Associate Publisher of Holiday, the national travel magazine, since I was probably the only registered Democrat in the whole Curtis building. A blogger’s response to my gender sensitivity sent me on a search for my connection to Betty Ford. Published in the Indianapolis Star, I found it in a photo of her at the podium in front of the huge jetliner. And there I am sitting in the second row! My moments with Betty Ford were few—an introduction, a brief greeting on behalf of my boss, and then we went right to the business of christening. Being politically correct once traveled as courtesy and good manners, the please and thank-you’s of past generations. I won’t debate the politics of gender, race, and profiling with my blogger, but I will offer him my sincere thanks for sending me on the path to remembering Betty Ford. I ordered the christening event photo today! Telly Savalas: Who Loves Ya, Baby?